TOFU MOM . . . and gravy! 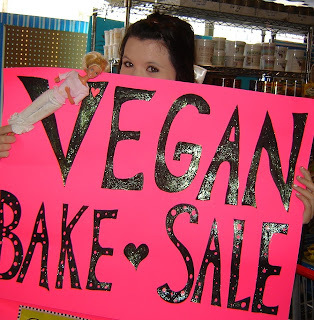 : Vegan Bake Sale and Olivia's Cookies!! Vegan Bake Sale and Olivia's Cookies!! So today my middle "Sprout", Olivia, baked her very famous and much-requested Vegan Chocolate Chip Cookies, and I have to say, we actually resisted eating most of them (a VERY difficult feat, believe me!). Olivia made these cookies to donate to the SideCar Bake Sale. SideCar is an all-vegan grocery in Seattle that supports Pigs Peace, an awesome animal sanctuary just out of Seattle. 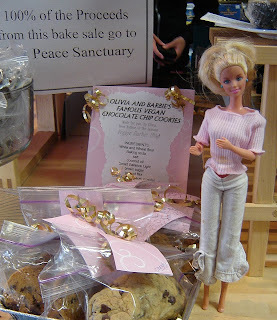 All proceeds from the Bake Sale, of course, went to Pigs Peace. We couldn't stay long, but the bake sale, organised by my friend and fellow-blogger Bethany, had the makings of being a huge success! We decorated a little sign for our cookies and make pink-and-gold tags for each bag, listing ingredients. And you'll notice Barbie came along? The pink and bling was specially for Barbie, of course... (I had to borrow these pictures from my daughter.) As you may or may not know, she (Olivia, not Barbie) is also a blogger and writes (when school and work allow) about the vegetarian world from Barbie's point-of-view. Check out "The Adventures of Veggie Barbie and Carnivore Ken" for some pretty entertaining reading. It's been posted before, but here's the cookie recipe again, should you have missed it. Enjoy. 2.) In a small bowl, mix soy milk VERY WELL (until creamy) with Ener-G egg replacer and flax meal using a fork. Set aside. 6.) Drop by small well-rounded teaspoonfuls (actually less than a teaspoon, more like 3/4 tsp) onto ungreased cookie sheet. 7.) Bake for 8 - 10 min. until lightly golden. Watch the time, it depends on the pan. This produces a bite-size, melt-in-your-mouth, chewy cookie. 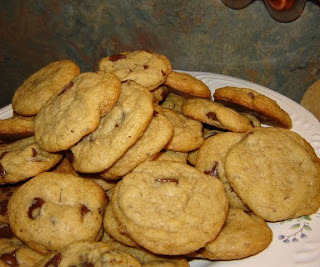 **If you want crisp cookies, or larger cookies, play with the baking time by just a few moments. 8.) Let cool on the pan 5- 6 min., just until set enough to remove to wire rack. They will be very soft and fragile, but will set up as they cool. Let pan cool before baking more. oh wow, they look amazing! you go, olivia! i will be trying this recipe for sure. i'm always looking for a new vegan chochip cookie recipe to try. congrats on the couches, boo-hiss on the computer. i'll send you some good tech vibes now and hope you find something soon. ps- i'm always looking for alternative pumpkin soup recipes too. thanks!